On Tuesday, the second bracelet winner of the 2012 World Series of Poker Europe was crowned as Antonio Esfandiari defeated a field of 626 players to capture the Event #2: €1,100 No-Limit Hold'em title, the accompanying €126,207 first-place prize and his third gold bracelet. The day began with 15 runners, but five hit the rail relatively quickly. 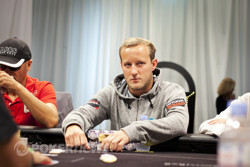 Casey Kastle was the first to go in 15th place, and he was followed out the door by Amaury Detoc (14th-€7,680), W.J. Vincent (13th-€7,680) and Joe Kuether (12th-€9,423). After the eliminations of Igor Kalinicenko (11th-€9,423) and Anthony Pons (10th-€9,423), the final table was set. Esfandiari entered the final table with the chip lead and was primed to capture his third bracelet, but he was joined by some stiff competition including five Frenchman looking to become the first ever to win a bracelet at the WSOP Europe. It only took a few minutes for things to heat up and happened when Remi Bollengier raised to 16,000 from middle position and received a call from Florian Ciuro directly to his left. The rest of the field got out of the way and it was heads-up action to the flop. Bollengier led out for 22,000 and then snap-called when Ciuro moved all in. Bollengier was ahead, but Ciuro was drawing live to either a king, queen or ten. Unfortunately for him, neither the turn nor river were what he needed and the one Frenchman eliminated the other in ninth place. A short time later, Salvatore Bonavena opened for 22,000 under the gun, and after another player had limped, Jamel Haddad moved all in for 165,000 from the small blind. Bonavena responded by moving all in himself, the limper folded, and the cards were turned up. 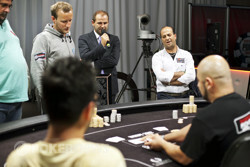 The board ran out and Haddad's day came to an end in eighth place for €14,736. After Day 1a chip leader Ashly Butler was sent home in seventh place, the clock ticked over to Level 21 and that is when action folded around to McLean Karr on the button and he moved all in for right around 170,000. Esfandiari then moved all in over the top from the small blind, the big blinf got out of the way, and the cards were flipped on their backs. Even though he was behind, Karr was all smiles and joked with his friend. "That's not a good flop," Karr quipped when the dealer put down the . "Jack," Karr said in hopes of picking up an open-ended straight draw. "Ok, now a jack," he added after the turn gave him a gut-shot. Unfortunately for him, it wasn't in the cards as the blanked. Karr shook hands with Esfandiari and then exited the stage in sixth place, good for €24,309. Valentin Detoc was the next to go in fifth place, and that’s when things got interesting. The blinds were fairly high, so the chips began to fly. Action folded around to Antonin Teisseire, the start-of-the-day chip leader, in the small blind and he moved all in only to have Bollengier snap-call from the big blind. The flop was a dagger through Teisseire's heart as it delivered Bollengier a set and an overwhelming lead. The Frenchman stood from his seat and then began to shake hands with his opponents when the turn left him drawing dead. The was put out on the river for good measure and Teisseire exited to a nice round of applause from the French contingent. In the very next hand after Teisseire's elimination, Esfandiari raised to 27,000 from the cutoff and then called when Bonavena moved all in from the big blind. The crowd could barely keep up with all the action, and for the second time in a row the suspense was smothered by a flopped set as Esfandiari's sixes found a third on the flop. The turn left Bonavena drawing dead, while the river sent him out the door in third place for €57,079. It was an exciting heads-up match as Esfandiari, who by this point had taken over the WSOP Player of the Year lead, was searching for his third bracelet, while Bollengier hoped to become the first French player to ever win a WSOP Europe bracelet. Esfandiari held a slight lead when the match began, and he never relinquished it on his way to victory. Congratulations to Antonio Esfandiari on winning his second WSOP win of 2012 and his third gold bracelet! That does it for our coverage from Event #2: €1,100 No-Limit Hold'em, but there’s still plenty of action to be had from the 2012 WSOP Europe. Check out our Live Reporting Section for more details. 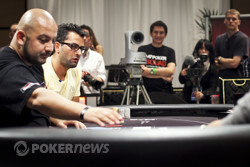 Antonio Esfandiari opened for 33,000 on the button and received a call from Remi Bollengier, bringing about a flop of . Bollengier checked, Esfandiari bet 37,000, Bollengier check-raised to 91,000, and "The Magician" made the call. When the turned, Bollengier check-called a bet of 126,000 and then checked the river. Esfandiari took about 15 seconds before announcing that he was all in, and Bollengier, who had 525,000 behind, shifted in his chair. The Frenchman tanked for a solid five minutes before whispering, "I call." Esfandiari proudly rolled over and immediately headed over to his supporters on the rail to celebrate. Bollengier's face said it all as he sheepishly flipped over and finished as the Event #2: €1,100 No-Limit Hold'em runner-up. Antonio Esfandiari opened for 33,000 on the button only to have Remi Bollengier moved all in for 338,000 from the big blind. Esfandiari seemed interested and asked for a count. "I really think I have the best hand," Esfandiari said upon learning it'd cost him 305,000 more. He thought about it for about a minute before counting out the chips and asking his opponent, "Do you want it?" A few seconds later, Esfandiari spiked in the call. Esfandiari was wrong in that he didn't have the best hand, but he did when the flop fell . Esfandiari turned to his supporters on the rail and said, "Blank out one time?" The turn brought him one step closer to his third bracelet, but the river snatched it away as Bollengier hit his straight to stay alive. Esfandiari threw his arms up to his head and bolted to his rail. He was showered with reassurances before heading back to the table to continue the action. On a flop of , Remi Bollengier checked and allowed Antonio Esfandiari to bet 41,000. Bollengier then woke up with a check-raise to 102,000, Esfandiari called, and the dealer burned and turned the . This time Bollengier check-called a bet of 106,000 before leading out for a healthy 187,000 on the river. Esfandiari double checked his cards and hit the tank for several minutes before asking, "I don't think you have a flush. Do you have a flush? No, right?" Bollengier sat in silence while Esfandiari hit the tank for another five minutes or so. "What should I do Remi? I'm so confused?" "I can't tell you. I don't know your hand," Bollengier finally said. Esfandiari spent another minute thinking it over and then tossed in a call, which prompted Bollengier to immediately send his cards to the muck. 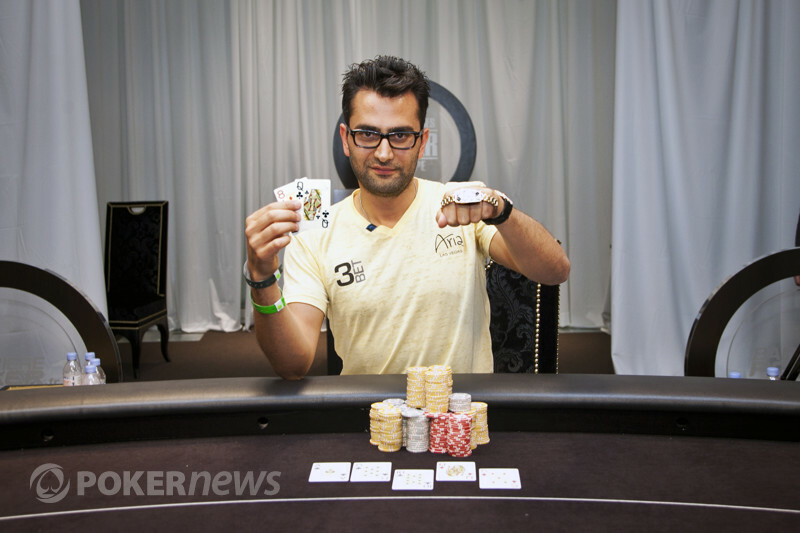 Esfandiari had to show his hand in order to collect the pot, and he tabled . There's been very little excitement since heads-up play began. The order of the seems to be for the small blind to raise to 33,000 and for the big blind to either fold or call. We've seen a couple flops from that, but a bet and fold has always ensued. Players are now on a 20-minute break. Salvatore Bonavena sees the flop and his chances fall. In the very next hand after Antonin Teisseire's elimination, Antonio Esfandiari raised to 27,000 from the cutoff and then called when Salvatore Bonavena moved all in from the big blind.